This started off as a slightly different list. Originally, this was going to be my Top Five fight scenes of all-time in comic book history. It’s another one of those Top Ten list ideas for our podcast that we have not gotten around to yet, and one that I thought had some legs and was eager to get a sneak-peek jump on by writing about my own personal preferred five for you. Top Five Fight Scenes In All Comics! Eh, Top Five Mano-A-Mano Fight Scenes In Comics Because Big Team Battles Are Hard To Judge. Okay, So, THAT, But Only Hero Vs Villain Fights. No Hero Vs Hero Fights. And even then, I looked over my list–I did have a Top Five that fit that criteria–and just felt so “meh” about it. I had some off-the-wall choices that I don’t think would make the cut on many other fans’ lists, and I don’t want to come across as era-biased or anything like that. But they were MY five, and I didn’t want to cut them to just go with some basic “safe” choices that any list-making site could give you. So I reviewed further, trying to determine how to right the swaying ship. There was one fight from the list that called out for further attention, and it involved Spider-Man. However, it made me think “Well, why THAT one? Spidey’s had a lot of great fights over the years; I could probably do a Top Five of just Spider-Man’s fight scenes”. Cue the lightbulb next to my head, and here we are. Before we jump into the list proper, there is one Honorable Mention, as it was the third fight that immediately sprung to mind, and it hung on the list until the very end when I found something else to bump it off. It’s Spider-Man vs Firelord from Amazing Spider-Man #270. It’s a fun brawl of an incensed Spidey punching WAY over his head against an opponent he had no business battling. It’s the ultimate example of Peter unleashing his speed and agility, in partnership with his Spider-Sense, to keep a more powerful foe off-balanced. I know this fight and issue get written off a lot as impractical, but for just a story purpose, it works and is a lot of fun. The Friendly Neighborhood Spider-Man and the Ol’ Canucklehead have crossed fists several times over the years, but their most memorable encounter was in this one-shot title simply called Spider-Man Versus Wolverine. For being a quick cash-in on two of Marvel’s biggest names having a dust-up, the book is actually pretty damn good. And while the fight is brief and doesn’t happen until near the end of the comic, it is wonderfully impactful. With no other way to save his friend Charlemagne, Wolverine has agreed to kill her. Spider-Man, mentally shaken from having found Ned Leeds’ dead body, jumps in to stop the mercy killing, and the two heroes brawl. After a few close calls because he’s too disturbed and distracted, Peter gives himself over to the instinctual fighting style of his Spider-Sense and begins hammering Logan, at one point pummeling him so hard against a tombstone that it cracks under the pressure. The two heroes get each other in a mutually-assured destruction kind of scenario, with Spidey in position to break Wolverine’s spine but Wolverine with his fist to the webbed hero’s chin, but it is broken up at that point. The scene ends with a jumpy Peter accidentally turning and punching Charlemagne so hard it kills her because he thought the X-Man was coming back for more, and this would haunt him for the rest of the issue. But like I said, this book is more than a rad fight. It gives wonderful character work on both stars, and furthers some things going on in both of those books in that era. Definitely read it if you haven’t already. by Roger Stern & John Romita Jr.
A two-parter that takes place across Amazing Spider-Man #229 and #230, this is one of Peter Parker’s most famous battles… and one of those defining Spidey moments. When Juggernaut comes for Madame Web, only Spider-Man can save her from his intentions, and what follows is a wild fight across New York as Spider-Man does everything he can to take a bite out of the unstoppable monster. Wrecking balls are useless, collapsed buildings barely bother him, and even running a tanker truck into him for an explosion doesn’t deter Juggernaut. Spidey finally jumps on the behemoth’s back, blinds him, stands strong under the pressure of his wailing fists, and guides Juggy into a pool of cement. With that, the Juggernaut is finally stopped. It’s a GREAT battle, with Spidey’s never-say-die attitude on full display, and he even runs out of webbing early in the fight to make the situation seem even more hopeless. Fellow Ghost, Andy Larson, also talked about this battle on our Character defining issues show of the podcast as his pick for Spider-man as well as in his Juggernaut write up on his Top 5 Marvel baddies. If two Ghosts agree on something, you know it’s the truth! We haven’t seen the last of J. Michael Straczynski penned books on the list, as this is the first of two, and it’s the last book to make the list before I started ranking and writing. 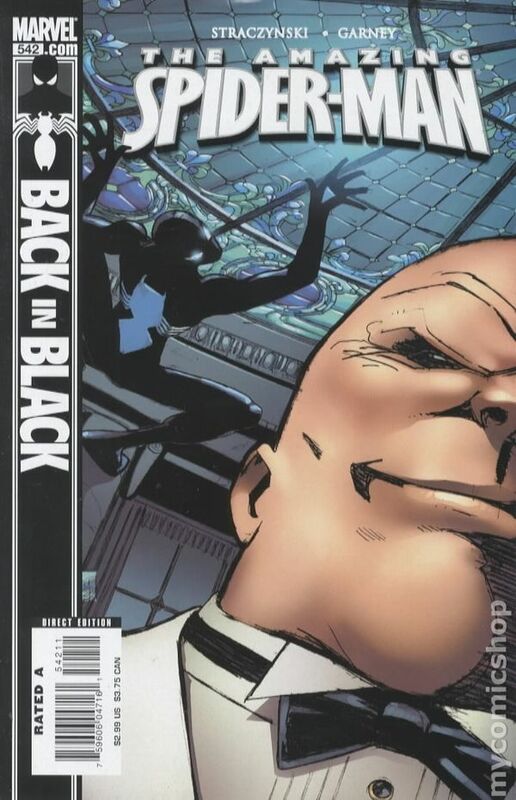 I thought I had this whole deal set, but as I was searching images to use as a banner for this article, I turned up a page from the climactic battle of this Amazing Spider-Man: Back In Black run. Immediately I knew I must include it. While a lot of Spidey’s best fights are desperate wars against foes much more powerful than he (Juggernaut or Firelord) or even-kieled struggles against other heroes (Wolverine), this is something different, and fun in its own right. In this fight, we see Spider-Man taking on an enemy who simply isn’t in Peter’s weight class… but who has deluded himself into thinking he is. Kingpin has historically fought Spider-Man evenly in their shared history in battles that make as little sense as when Pete took down Firelord, but here, Kingpin has pushed Spider-Man too far by sending an assassin after Parker’s family. What follows is an utter humiliation of Wilson Fisk; Spider-Man easily defeats the crime boss while verbally reminding Fisk how hopeless a physical confrontation is. To further it all, the fight takes place inside a prison, and the Kingpin loses face in front of the very men he constantly seeks to use as pawns in his rise to power. If you are the kind of fan who thinks the idea of characters like Batman and Superman fighting is ludicrous because one should just wipe the floor with the other, then this is the story for you. Garney does great work making Peter feel more imposing even in the face of the larger Kingpin, and there is no story-driven evening of the playing field. It plays out exactly how it should. There just HAD to be a Venom fight somewhere on this list. It was imperative. The question was simply: WHICH Venom fight? Going down the list chronologically, I found this battle, from Amazing Spider-Man #346-347 to be a favorite. Of the earlier contests, none quite seemed to match the intensity and sense of foreboding that this one offered up. In typical comic villain plot convenience, Venom has Spider-Man defeated and unconscious after tricking him into a cryofreeze. From there, Venom LOADS HIM UP ON A PLANE AND FLIES HIM TO THE CARIBBEAN so that they could have their death battle on the privacy of an island. Did… was Adam Sandler secretly Venom the whole time? Anyway, aside from that, this fight drips with dread; Peter is all alone, running low on webs, facing a foe he had NEVER defeated straight-up to that point, and in territory that Venom has scouted. Oh, and there is an abandoned village complete with burial ground in the middle of the chosen arena. It’s all Spidey can do for most of the issue to just flee from the symbiote-covered foe and try to come up with a plan. But plan he does, and between physical confrontations against Venom, this issue is all about Spidey thinking on his feet and running on survival instinct. What it ultimately comes down to is Parker having to trick Venom into thinking the former died during their fight… when in reality, he was swimming out into the ocean and hoping to come across some kind of ship to take him to safety. How awesome does that make Venom look when Spider-Man would rather FLEE INTO THE OPEN OCEAN than fight him? Say what you will about Brock nowadays, but Marvel did a great job at making him seem unbeatable for years after his debut. 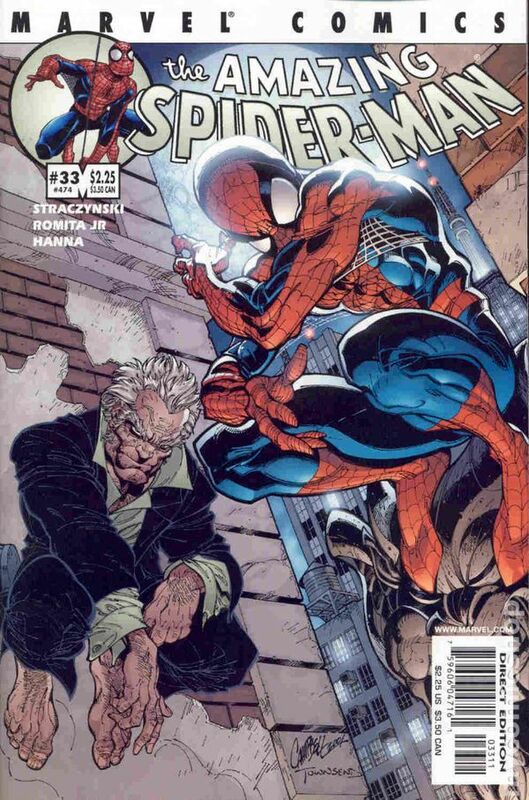 by J. Michael Straczynski & John Romita Jr. The fight that birthed this whole idea, as it would have been one of the five I included in a non-Spidey-centric list, this is a fantastic cover-to-cover war between Spider-Man and the debuting Morlun. After having finally tracked Spider-Man down, Morlun battles his would-be prey for HOURS around New York in what is, for my money, one of the best issues of Romita Jr’s illustrious career. I run hot-and-cold on JR Jr’s art, but he absolutely brought his A-game here, showing off a Morlun who is confident, sophisticated, and proud going up against a Spidey who gets more and more battered the longer the encounter drags on. There is real emotion in the pencils here, and it fits the dramatic fight that Straczynski laid out. The best part of this comic is the ending where, after finally creating some distance between himself and Morlun (an explosion doesn’t stop the vampiric foe, but it does, at least, cause him to leave to get new clothes), Spider-Man barges into the offices of Ezekiel, who had previously promised Peter sanctuary. At that point, Ezekiel tells him there is no longer any hope; now that Morlun has found him once, no force on Earth can keep him from the wall-crawler. After a brutal struggle that sees Spidey incapable of doing lasting damage to his enemy, it’s a bleak declaration. There you have it… The five best physical confrontations ever written for Marvel’s pre-eminent web-slinger! What do you think? What are your favorite Spidey fights? Let me know in the comments, and don’t forget to subscribe to our mailing list while you are here, so you never miss an article or a podcast where we discuss this kind of stuff weekly! Until next time… take care!